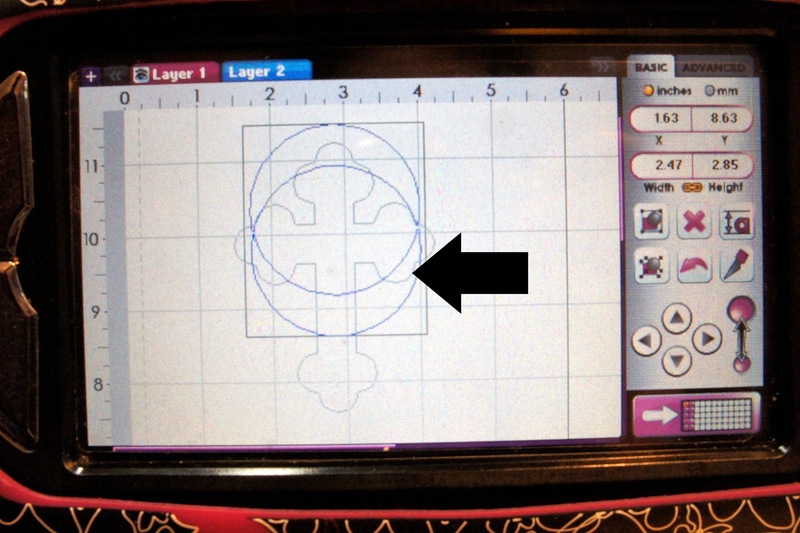 It is time for the My Pink Stamper Design Team Post for April. This is where the entire Design Team gets together once a month and makes a collective post on Robyn's (My Pink Stamper) site. And what a post it is...there are usually over 20 projects for you to see. When you are done reading my post, please go back to My Pink Stamper and check them all out. This month our challenge as a Design Team was to make a favor...what kind of favor--ANY!! We are showcasing some of the stamps from her last release. I used the More Faithful Sayings and Happiest Moments sets. You can go HERE to find out where you can pick up these fun stamps of your very own! I went back and forth with ideas of what to make for this project and couldn't come up with anything I loved...then one night I put my head down on the pillow to go to sleep and it just popped in my head. The next morning I made this as soon as I woke up. I think these will make the perfect addition to the Easter dinner table. Easter is coming....this year my Easter is the same as American Easter. I am Greek Orthodox and every year it rotates. Darn...this year we don't get the Easter clearance candy, LOL! But, seriously, Easter is a very important holiday to us. 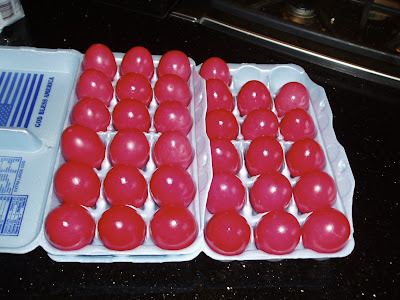 One of Easter traditions in our religion is to made all red Easter Eggs. It signifies the blood of Christ. The eggs are usually dyed the Thursday before Easter and saved to "crack" on Easter. When everyone is seated at the table we have a tradition to crack the eggs. Everyone has an egg...there is usually quite a fight over the eggs--of course you want a nice strong one!! Then you choose someone to crack with. Only tops smashing to bottoms please. You need to attack the other egg head on (many people are known to cheat). When you hit your partners egg you say "Chistos Anesti" (Christ has Risen) and the other person says "Haristos Anesti" (truly he has). The winner is the only person left at the table that has a unbroken end. Speaking of cheating....as you can see in my favor I have a red egg. Now this is not your ordinary Greek Easter Egg. It is a cheater egg that roams around members of my family that try to cheat!!! It is wooden and painted red.....unfortunately, I never get to use it. We also put the red eggs in our Tsoureki (Greek Easter Bread). 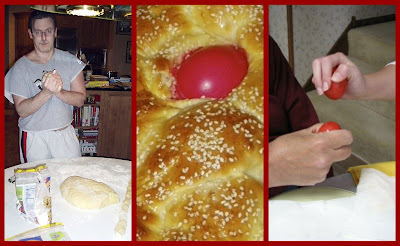 My husband, Mr. Irish, himself makes the BEST Greek Easter bread I have ever eaten. He had a good teacher, my Yaya (Grandma) before she passed away. Here are some past year pictures. It is quite the event in our house to make the bread and eggs together. Now....on to the details of my project. 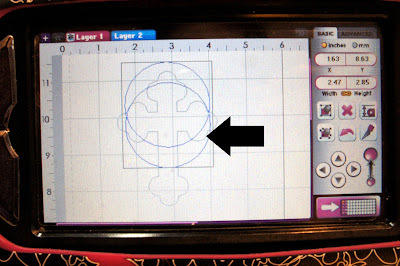 To make the banner for the cross I put the cross into my Gypsy, opened another layer and placed two circles on top of each other overlapping to make the banner shape. I stamped the banner by manipulating the stamp to fit the shape. The holder was made from the Cricut Lite Cupcake Wrappers cartridge. I attached the cross from the Easter 2010 Limited Edition cartridge to the back of the assembled wrapper. After the top piece of the wrapper was cut, I used a Zig Paint pen in gold to touch up the edges. The paper I used has a white core and I didn't want it to show. A really easy project, that one that has great significance in my life. Cupcake Wrappers = wrapper at 2.75"
Easter 2010 = Cross @ 3.5"
Gorgeous project Maria and what a beautiful tradition!! I love the significance of the red egg. Hope you and your family have a wonderful Easter! Very pretty. 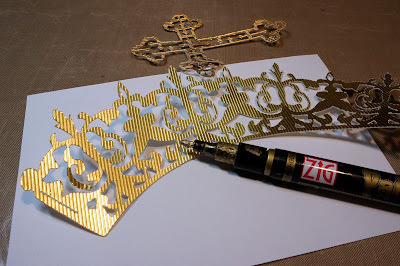 I really like the gold zig pen on this. We wish you the happiest of Easters! Beautiful!! And I love your tradition of the red egg--really meaningful. Thank you for sharing that with us :) Happy Easter--He is Risen Indeed! Nice project!! Thanks for sharing! Kudos to you for keeping traditions alive and fun. Beautiful project...thanks for sharing your traditions with us! Great table decoration...it's so pretty!! 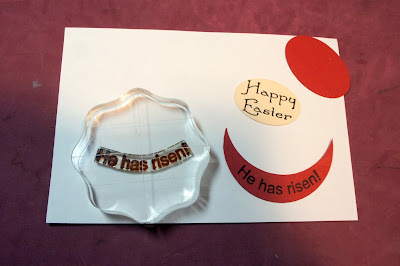 Oh, I love your project & the your family's easter traditions. Sounds like so much fun!! 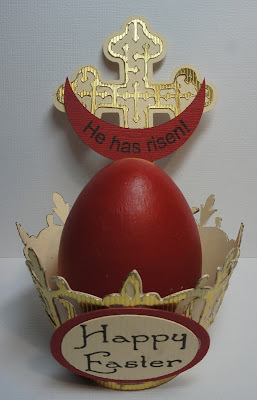 What a wonderful project for the Easter week. You are always so creative in every one of your projects. You are an inspiration! TFS. Thank you for sharing your Easter Traditions with us. Great project. Isn't it funny how you can't think of what to make and then instantly it hits you and it is all designed in your head. This is just SO gorgeous! I love to see some of your wonderful culture in your project today. And thank you so much for the beautiful birthday card! What a treat! This is simply STUNNING! I worked for years with Greeks in diners & had the pleasure to share in their Easter too! What a beautiful tradition and your project is stunning. Wow, this is beautiful and I love another way to use the cupcake wrappers! What do you use to dye your eggs red?? They are a beautiful shade of red! I loved reading about your Easter tradition! 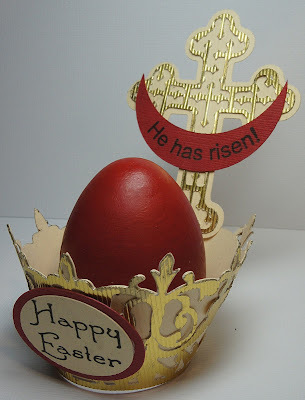 I think I would like to incorporate the red egg part and cracking part into my own Easter traditions!! maria...what an elegant project you have made here. i am like what? it is beautiful. thanks for sharing dome of your traditions with us. Wow! what a wonderful project! Thanks for sharing your tradition ! Happy Easter! Great job...very original project. Happy Easter! Ha! I started to do this in our family about 10 years ago! I just made up the rules! Who knew it was a atradition in someone elses home!! Yay! Now I just wanna go back and see if you have any tricks to dying your eggs red! Maria,....oh my, what words do I start with?....this wonderful Easter creation is.......wonderful. I loved reading the story and process.. Happy Easter. Beautiful egg holder. Very well designed and executed. What an interesting tradition. thanks for sharing. Meanwhile, please checkout my 100th Post Giveaway - ends midnight May 1, 2011.